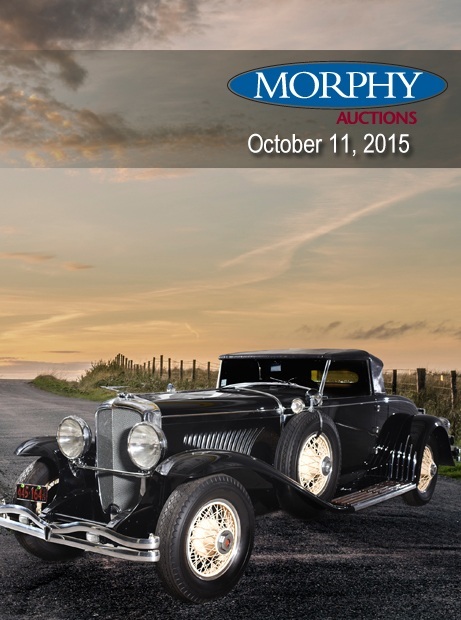 Morphy Auctions is proud to represent the Paul Hedburn collection of historic automobiles highlighted by the most original 1929 Duesenberg Model J Convertible Coupe in existence. With detailed history of ownership since its original order being placed in June of 1929, only three women have graced its possession over the last 86 years. Past winner of the famed Meadow Brook Concours Best Original Car, the J-192, serial number 2212 has traveled just 33,000 miles from new. Just one of the many pre-war treasures offered fresh to market and sold at no reserve. Saturday, October 10 – Join us for an evening under the tent. Music, food and refreshments will be served 5:00 PM – 8:00 PM. Sunday, October 11 – Preview opens at 9:00 AM. Auction begins at 2:00 PM. 1931 Ford Model A Deluxe Roadster. 2009 Big Bear Chris Angel Tribute Motorcycle. 1960 Chevrolet Impala Sport Sedan. 1934 Ford V-8 Station Wagon. 1959 Mercedes Benz 190 SL. 1956 Chevrolet Bel Air 2dr Hardtop. 1973 Ford Mustang Mach 1. 1916 Indian V-Twin Motorcycle & Side Car #88H589. 1967 Jaguar 3.4s Sports Sedan. 1951 Chevy 3100 Pick Up. 1954 Jaguar XK 120 Drophead Coupe. 1955 Austin Healey 100M Tribute. 1917 Indian Model 51 T Deluxe Bicycle. 1904 Franklin Model B Light Tonneau. 1962 Mercedes 220 SEb Cabriolet. 1965 Mercedes Benz 230 SL Pagoda. 1918 Cadillac 7 Passenger Touring. 1909 Packard Model 18 “NA” Town Car. 1905 Rambler Everly Type 1 5-Passenger Surrey. 1907 Packard Model 30 “U” 7-Passenger Touring Car. 1948 Pontiac Silver Streak “Standard” Woody Wagon. 1937 MG SA Tickford Drophead. 1929 Duesenberg J Convertible Coupe, Rumbleseat. Per Pennsylvania law, transactions will not finalize until Monday, October 12. For more information on bidding or consigning, please contact us: 877-968-8880.